I went out this lunch hour in the 95+ degree weather to clean up a site that it is promising. This task was assigned to the Mighty Compadre. I just love that little power-house of a detector. After an hour, I had a respectable amount of wire, nails, foil and even some pulltabs in my pocket. I wasn’t expecting any coins as I know those are beyond the depth capabilities of the Tesoro Compadre and its five inch coil. No matter. I considered my hunt a success. Now I can return with the Bliss and the 15 inch coil to explore the depths of that dirt. On my way back I began to think about what a different detectorist I am today. Five years ago there is absolutely no way I would have done what I just did. No way José. So what’s different? I believe the answer is that I stopped being a treasure hunter and became a detectorist. Wait a minute pullTab!, I hear you say; aren’t those synonyms? Well, not in my way of thinking they are not. See, when I began to detect for fun and profit, I was really mostly going after the profit. Finding things that could not readily be turned into cash would just ruin my day. I was rather petulant about it if I am to be honest. I did not accept the reality of metal detecting; and that is that the ratio of trash to good stuff is somewhere in the vicinity of 1000/1 and in some parks around here, that’s actually a pretty good ratio! I was in other words, hunting for treasure. Later, as I packed in the hours detecting, I began to relax a bit and began to explore the signals for the sheer pleasure of exploring them. Don’t get me wrong, I still love that shiny silver and gold but now I can really enjoy a sortie even when all I find is junk. I believe now I can really be described as a detectorist true and through. You could say I am no longer one dimensional when it comes to our beloved hobby. I’ve grown wiser… Ok, I’ll stop making myself look good. Pardon my Bulgarian. Nah! I don’t really speak Bulgarian but I did teach myself to read the Cyrillic script. Incidentally, that last word, with four characters, spells the word ‘park’ just like in English. I returned to the deep silver park at lunch today. Now that I can ground balance the Bliss like a boss (OK, maybe not like a boss but well enough) I wanted to let my Blisstool V3 metal detector loose on a patch of park where I have gravely removed all targets but the iron. Mind you, I have removed a lot of iron as well. Right away, I began to get nice solid signals. I am not shocked that I found the aluminum foil. In this spot, there stood a swing set from about the 30’s to the 60’s. I have found close to a hundred of what appear to be aluminum seals for old timey milk and juice glass bottles. I remember those suckers from my childhood. Somehow I missed them with the Deus. Most were at the 7-8 inch mark. They could also be from Boy Scout and Girl Scout camp outs as I have also found a good number of Scout related items at this spot in the past. They are distinctively round and gold colored. I was rather surprised however to pull that beaver tail pull tab. I could swear there were no such signals left here. Then I found that 1946d Wheat cent. No matter how many times I declare this spot coin free, I am proven wrong. By the way, I intend to keep on posting my Wheaties. First, because I want to prove that you can use the Blisstool V3 to detect trashy parks and still find coins. Second, when I start finding the really cool stuff, and I will, I want all the haters to know I don’t plant coins for my self-glorification and if I was to do that, I most certainly would not plant Wheats from the 40’s! I am pleased with the progress I am making with Dragomir. I have a very good feeling about this machine. I went out this morning for a couple of hours with my Blisstool V3 metal detector to the small park I’ve been hunting lately. My plan was simple: dig. It is my opinion that you cannot learn and master your metal detector unless you dig a lot of trash. To train my ear, I dug and dug and dug until I could dig no more. I dug a lot of shallow targets. By doing that, I could see that the discriminator circuitry works really well when it comes to targets down to about 7 inches. I dug some deep targets too and past 7 inches the discriminator got fooled a few times but still it was impressive. I am slowly honing in to the sweet signals. The 1910 wheat pictured above was such a signal. This tiny park still has a lot to give up, and I am just the guy to get it. It was nice and sunny today at lunch so I took Dragomir, my Blisstool V3 metal detector to the oldest park in the city. I’ve talked about this park before. 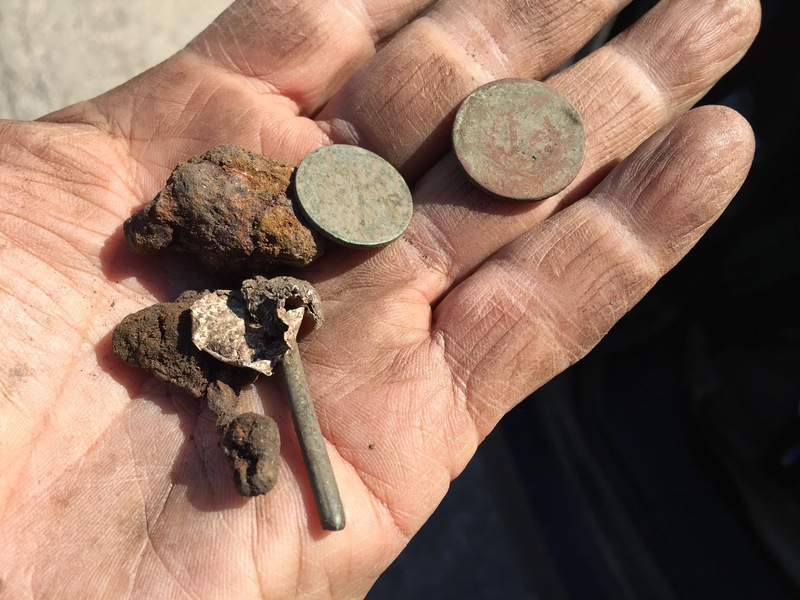 It is a small park, smaller than a city block in fact but it has produced some nice silver and other old coinage for me with a variety of metal detectors. As far as trash, this park is at DEFCON 4. It is hard to hunt with any detector if you don’t have the patience. Definitely it is the kind of park where a small coil would be indicated. Except that the coins I am hunting are too deep for a small coil. So I must endure the cacophony of beeps. No silver but yet another old coin. 1916 D Wheat cent. No too badly worn so it must have been dropped closed to its mint date. This cent was minted when the U.S. had not yet entered WWI and Wichita was experiencing a growth boom. With time and practice, my ears will become more attuned to the winning signals. After using the Bliss for a few days I noticed somethings were not working as they should. Never being one to blame the machine, I knew the issues were due to my inexperience with Dragomir. I reached out to a more knowledgeable Blisstool user and he gave me some pointers to properly do a manual ground balance. 1) Auto-ground balance left my machine ‘hot’, way hotter than I would normally run it. 2) Manual ground balance was extremely easy, so long as you know that the pots, i.e. knobs, are rather sensitive. The biggest problem with the manual ground balance was finding a spot in the park devoid of metal. I had to actually clean a two by two foot spot in order to balance Dragomir. Having completed this task, the number of false signals dropped to near zero and I was able to discriminate fine. So armed with Dragomir in its more stable state, I went where a road ran through an old park. The road was removed sometime in the 90’s and a person who was there at the time they removed the road, told me that they found large cents and Seated coins and so on and so forth. The beauty of this spot is that it is relatively devoid of modern trash besides being rather large area wise. I began and hardly a signal was to be had, as I expected. Finally, I got a nice repeatable signal and I went for it. Digging there you can immediately tell there was a road in the past. There were chunks of asphalt and cement but around the 5-6 inch mark, I found the target. I could see that the chunk of asphalt and dirt I dug up was round. My heart was giddy with the anticipation of uncovering a precious Seated dime. I put in the work. Dragomir put in the work. This was our reward. Leave it to me to find the only clad coin that was possibly dropped by a city worker at some street repair job in the past. Sigh! cannot give me a solid repeatable signal on a dime 12 inches under the ground (with the 11 inch coil). And that is the purpose of the Blisstool. The Deus will unmask a coin better than any machine out there and the Blisstool will sniff me out some of the deepest stuff. But I cannot control what was dropped in the past. This morning at the park where I found some old coins late last year the Bliss and I dug a bunch of deep holes. 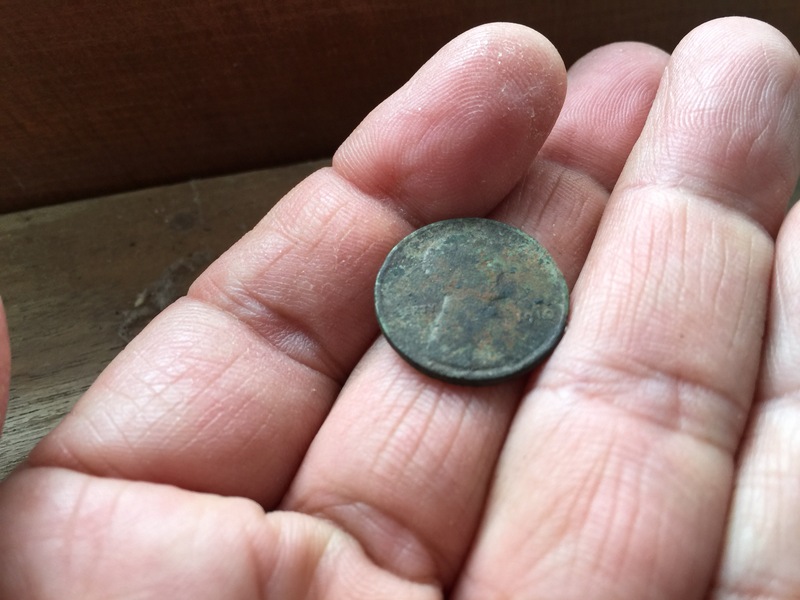 After a couple of rusted iron bits and a couple of ‘holes to nowhere’ the Bliss found its first coin: a 1915D wheat. I was excited and forged on. After leaving my soul in every hole I dug, I was beat. Digging 14 inch deep holes is hard work, especially when you never reach the target. I definitely need a relic digging shovel. Finally, the Bliss found its second coin: A toasted 189x V nickel. I wanted to stay and find that Seated but I had promised my family I would only stay out for a couple of hours. No matter, those deep seateds aren’t going anywhere.